This week in our Literary Resolutions blog series, we hear from Steve Kirk, Blair’s editor, about his delayed success in completing a reading resolution. I made my literary resolution early (mid-December) and broke it early (January 2). The previous two years, I’d read the opening and middle volumes of Stieg Larsson’s “Millennium trilogy” over the holidays and happened to finish them on New Year’s Day. 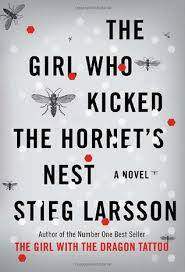 So I resolved to end 2013 and begin 2014 with the final book, The Girl Who Kicked the Hornet’s Nest. But owing to company in the house, I didn’t finish until well past my target date. No matter. Larsson’s novels are my kind of blockbusters—brisk, complex, and transportive. Though he goes on too long about Swedish politics and over-introduces minor characters, those flaws are overwhelmed by what he does well—namely, create memorable protagonists (Mikael Blomkvist and Lizbeth Salander), intricate plots, and an exotic setting. In Hornet’s Nest, he sustains a lively 563 pages with his title character mostly confined to a hospital bed and his two heroes together only on the last couple of pages. I admit to being flummoxed by all the Jonassons, Carlssons, Erikssons, and Goranssons. And when I began the series, I pulled up a Stockholm map on my computer and made a futile effort to follow the action as I read. But I soon learned to plunge right in and let myself be transported. By the end, whenever Mikael Blomkvist might leave Café Copacabana next to the Kvarter cinema in Hornstull, then turn on to Bergsundsstrand on his way to the tunnelbana, I was right there with him, wherever it was we happened to be going. Stieg Larsson wrote mostly for his own entertainment. He died in 2004 at age 50 from a heart attack after climbing seven flights of stairs on a day the elevator broke down. He never saw his novels hit print; they’ve since sold well over 70 million copies. Larsson had a fourth volume in process, a fifth and sixth at least in synopsis form, and a seventh through a tenth planned. My coming holiday seasons will be the less for his passing. Join us next week for another post in our Literary Resolutions blog series. Happy reading!